Steel plants use a large amount of water for a variety of usage which includes cooling, dust suppression, cleaning, temperature control (heat treatment), transport of waste materials (ash, sludge, and scale etc. ), and other usages. Water is an essential part of some processes such as moisture content of coking coal, pelletizing of sinter mix, making of green pellets during the production of iron ore pellets, production of steam and hence power, and granulation of blast furnace slag etc. Use of large amount of water also generate huge quantity of waste water which may contain suspended solids and many dissolved substances and chemicals. The quality of waste water depends on the process where the water is used and for the purpose for which it is used. The major environmental effects of the untreated waste waters of the steel plant if discharged into the receiving water bodies are namely (i) toxicity to aquatic life, (ii) reduction of dissolved oxygen, (iii) silting due to suspended solids, (iv) taste and odour problems, (v) temperature rise affecting the dissolved oxygen, (vi) effect on the aquatic life, and (vii) formation of oil slicks due to the floating oil etc. The large volumes of process water that come into direct contact with the raw materials, products, and off gases is required to be treated for reuse of water, for recycle of the water, or for the removal of pollutants to the levels fixed by the regulatory authorities prior to its discharge. The quality of waste water can be controlled by adopting improved technologies developed for different processes these days. Technologies are also available now to treat the waste water fit for either recycling in the same process or in other processes. Treatment of waste water also results into recovery of some solid waste materials which can be recycle back in the process either as such or with some further processing and thus contributing to the conservation of the natural resources. In order to conserve water as a resource, there is a movement towards not just preventing the waste water from causing pollution, but also to treat the waste water and recycle it in a closed system so as to reduce the consumption of fresh water. The main processes of an integrated steel plant that require waste water treatment include coke making, Iron making, steelmaking, hot and cold rolling, and other operations such as pickling, electrolytic tinning, and other coating processes. The parameters of most significance, which are generally regulated by the statutory authorities are suspended solids, oil and grease, phenol, cyanide, ammonia, and heavy metals such as lead, zinc, chromium, and nickel. In addition, there are several organic compounds for coke making and cold rolling operations which are regulated. 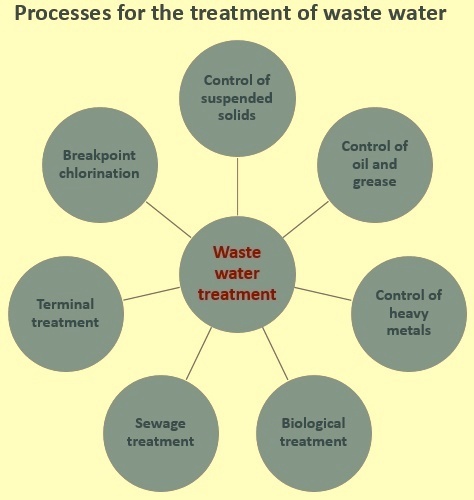 The following describes the normal waste water treatment processes employed for effective treatment of the waste waters of the steel plant (Fig 1). Removal of suspended solids from the waste water is practically necessary for all of the production shops in the steel plant from coke making to the finishing mills. Solid particulates become suspended in process water streams during cleaning and cooling of flue and off-gases, slag granulation, descaling, roll and product cooling, flume flushing in rolling mills, and during product rinsing in finishing operations etc. The methods which are generally employed for removing suspended solids are (i) sedimentation, (ii) centrifugal separation, and (iii) filtration. Sedimentation also known as clarification consists of settling by gravity. The process is generally carried out either in a clarifier or inclined plate separator specially designed for a given application. Clarifiers are usually in circular shape but also can be constructed in a rectangular shape. An advantage of inclined plate separators over clarifiers is that they need far less ground space. However, care need to be exercised in their use when there is a high oil and grease concentration in the waste water. The disadvantage of inclined plate separators is that there is a small storage volume for sludge at the bottom of the separators. Both clarifiers and inclined plate separators are designed for continuous removal of the collected sludge from the bottom of the unit. The underflow sludge is usually thickened by gravity before being further dewatered in one of the several types of sludge dewatering equipments (examples are filter press, belt press, or centrifuge etc.). This is done to reduce the sludge volume so that it can be handled easily and economically during its disposal. Coagulating agents, such as alum, ferric chloride, ferric sulphate, ferrous sulphate, ferrous chloride, and commercial organic polyelectrolytes etc. are frequently added to the waste water prior to clarification for promoting flocculation of the solid particles. This increases their effective size and thus increases their settling rate. Centrifugal separation is a technology which is being used to remove suspended materials from the water column utilizing centrifugal forces. The separation technique is also sometimes being called as cyclone separation. The process is highly dependent upon particle size and specific gravity. Larger particles and higher particle density improves the separation performance. Multi-media or single media filtration, by either pressure or gravity, are other methods for the removal of fine suspended particulates and these are generally applied to the waste waters of the steel plant. The waste water is passed through a filter media contained in a container. The system is normally comprised of a number of individual filtration units working in parallel. Sometimes side-stream filtration is utilized to treat a portion of the waste water which is then blended with the unfiltered portion. Normally the design of the filter system is such that it has the highest feasible flow rate through the filter media so that the required size and cost are minimized. In a typical multi-media system, the waste water first passes through a relatively coarse layer of media (e.g. anthracite coal) and then through a layer of fine media (e.g. sand). Most of the particulates are removed by the coarse media layer, while the fine layer does the final polishing of the waste water. Multi-media filters are generally used when there is a high oil and grease content in the waste waters. High oil and grease concentrations can result in fouling and/or blocking of the media in both single and multi-media filters. The collected particulate is to be removed periodically from the filter media by back washing. In the operation of back washing, the incoming flow of waste water is stopped and a stream of treated water, and sometimes air, is passed through the filter media in the opposite direction to flush out the collected solids. By having a number of filter units installed in parallel, one unit can be put through the back wash cycle without causing interruption of the continuous treatment of the waste water stream. The back wash stream is usually settled in a back wash holding tank, and the solids are processed through a thickener and sludge dewatering equipment. Both single media and multi-media filters are capable of yielding a high degree of clarity to the waste water streams. However, clarifiers are generally used for pre-treatment of waste water which are heavily laden with solids to remove the majority of the particulates prior to the filtration. Filters can be used alone without prior clarification in case waste water is having lesser solids. The quantity of suspended solids and other particulates discharged to a receiving water stream can usually be greatly reduced by recirculating the water back to the process. However, the degree of recirculation that is feasible gets limited by the amount of suspended solids present in the waste water and the build-up in the concentration of dissolved solids in the system, which can ultimately lead to deposition and blockages in the piping and the equipment. Hence, a certain portion of the circulating water volume is always required to be released as blow down to control the concentration of dissolved solid to an acceptable level. Oil and grease are usually found in waste waters from continuous casting machines, hot and cold rolling mills, pickling, electroplating, and coating operations. The oils originate from equipments, product lubricants and coolants, hydraulic systems, and preservative coatings applied on the product during certain processes. Oil and grease are usually removed from the waste waters by employing several methods which include skimming, gravity separation, air flotation, filtration and ultra-filtration. If the oils are insoluble in water, they are removed from waste water by gravity separation and skimming. Gravity oil separators generally have rectangular chambers in which the velocity of the waste water stream is slowed down sufficiently so as to provide time for the oil and grease to float to the surface, from where they are removed by any of the various kind of available skimming devices. Some examples of skimming devices are rotary drum skimmer, rope and belt type skimmers, and scraper blades, which are also used to scrape the heavier solids that have settled to the bottom. Insoluble oils also can be removed along with suspended solids in the multi-media filters. If the oils are emulsified or water soluble, such as those found in waste cold rolling solutions or rinse waters, they are required to be treated by acid or emulsion breakers to break the emulsion, followed by gravity sedimentation and skimming, or by air flotation and/or membrane separation technologies. Skimming can be used on any waste water which contains ingredients that float to the surface and is normally used to remove free oil, grease, and soaps. Skimming is often used with air flotation or clarification to improve removal of both settling and floating materials. The removal efficiency of a skimmer is a function of the density of the material to be floated and the retention time of the waste water in the tank. Gravity-type separators tend to be more suitable for use where the amount of surface oil flowing through the system is fairly large in amount and consistent. Air flotation process is generally used to separate floatable materials having a density which is close to the density of water and hence cannot be effectively separated by gravity alone. In the flotation process, gas bubbles (usually of air) which are released in the waste water, gets attached to the oil and fine solid particles, causing them to float more rapidly to the surface where they are skimmed off as a froth. Chemical additive agents are sometimes used to improve the performance of the flotation process. Ultra filtration process includes the use of pressure and semi-permeable polymeric or ceramic membranes to separate emulsified or colloidal materials suspended in a liquid phase. The membrane used in an ultra-filtration unit forms a molecular screen which retains molecular particles based upon their differences in size, shape, and chemical structure. The membrane permits passage of solvents and molecules with lower molecular weight. In the ultra-filtration process, the waste water is pumped through a tubular membrane unit. Water and some low molecular weight materials pass through the membrane under the applied pressure ranging from 0.7 kg/sq cm to 7 kg/sq cm. Emulsified oil droplets and suspended particles are retained, gets concentrated, and are removed continuously. Regulatory authorities normally limits the discharge of heavy metals from the steel plant process waters from blast furnace shop, steel melting shop, as well as from pickling, cold rolling, electroplating, and hot coating operations. The normal method used for removal of these trace metals is chemical precipitation followed by clarification or filtration. It is a well-known fact that the solubility of heavy metals in water is a function of pH. Usually metals become less soluble as the pH increases. Hence to remove dissolved metals, the waste water is treated with an alkaline material in a mixing tank with a pH controller. In most of the chemical precipitation processes the separation of heavy metals is by hydroxide and sulphide precipitation. In hydroxide precipitation, lime, which is the least expensive reagent, is normally used, although caustic soda, magnesium hydroxide, or other alkalis are also sometimes used for this purpose. After the pH is raised to a level where the dissolved metals precipitate as hydroxides, the water is passed either through a clarifier and/or through a filter for the removal of the precipitated metal hydroxides. The addition of a coagulating agent is normally needed. The use of a coagulating agent such as ferric chloride at an alkaline pH results in the formation of an oxy-hydroxide surface, which improves additional removal of metals by adsorption. Other coagulating agents such as alum, ferrous sulphate, and polymeric flocculants can also be used to improve the particle formation. If chromium is present in the hexavalent form, it must first be chemically reduced to the trivalent form before it can precipitate. The rate of this reduction reaction is a function of the pH condition of the system. As an example, the pH of the system is to be adjusted in the range of 2.0 and 3.0 if sulphur dioxide, sodium bisulphite, or spent pickle liquor is used as the reducing agent. Hexavalent chromium can also be reduced to trivalent chromium with sodium hydrosulphite at a relatively higher pH (ranging from 8.5 to 9.5). The reduced trivalent chromium ion is then converted to insoluble chromium hydroxide and is removed by sedimentation. Dissolved metal ions and certain anions are normally chemically precipitated and removed by physical means such as sedimentation or filtration. In addition to the use of alkaline compounds, the following are other reagents which can be used. Metal sulphides—Except for chromium sulphide, the solubility of metal sulphides is lower than that of metal hydroxides. Hence the removal of dissolved metals can be improved using the sulphide precipitation process. Both soluble sulphides, such as hydrogen sulphide or sodium sulphide, and insoluble sulphides, such as ferrous sulphide can be used to precipitate many heavy metal ions as insoluble metal sulphides. Presently, the use of organic sulphide has become popular for the treatment of waste water. Normally the process of sulphide precipitation includes clarification and filtration. Carbonates—Carbonate precipitates may be used to remove metals either by direct precipitation using a carbonate reagent such as calcium carbonate or by converting hydroxides into carbonates using carbon dioxide. Chemical precipitation as a mechanism for removing metals from waste water is a complex process generally consisting of two steps namely (i) precipitation of the unwanted metals, and (ii) removal of the precipitate. A small amount of metal usually remains dissolved in the waste water after the complete precipitation. The amount of residual dissolved metal depends on the treatment chemicals used, the solubility of the metal, and co-precipitation effects. The effectiveness of this method of removing any specific metal depends on the fraction of the specific metal in the waste water (and hence in the precipitate) and the effectiveness of suspended solids removal. Biological oxidation is the normally used technology for the treatment of coke oven and by product plant waste waters. These waste waters contain substantial quantities of phenol, cyanide, thiocyanate, and ammonia, plus lesser concentrations of other organic compounds, mainly because of the condensation from the raw coke-oven gas which contains these substances. Biological treatment is a conventional method used for the treatment of the waste water from the of coke oven and by product plant before its disposal. Because biological oxidation is highly sensitive to fluctuations in constituent loadings and pH, the waste water is first passed through an equalization tank to level out the concentrations, the temperature, and the flow volume. Conventional method of biological oxidation normally consists of either a single-stage or two-stage system. In a single-stage system, the process is designed to reduce the organic compounds as well as ammonia in the only stage of the process. In a typical two-stage system, the first stage is designed to reduce the organic compounds and the second stage is normally used for the nitrification (ammonia removal). Sometimes, with careful control, both carbonaceous and nitrogen treatment can occur in the same aeration tank. Normally the biological treatment of thiocyanates results in an increase of ammonia in the waste water. This is required to be accounted for in the design of the biological oxidation treatment plant. Both aeration systems typically utilize an activated sludge process, followed by a clarifier. The activated sludge process is a suspended growth process similar to that applied in sewage treatment plants. In the aeration system, a mass of microorganisms or biomass in the form of suspended solids, called an activated sludge, is supplied with oxygen, which enables it to reduce the biologically degradable constituents in the waste water. Populations of microorganisms can be developed that can effectively degrade phenol and other organics, thiocyanate, free cyanide, and ammonia. The required oxygen is supplied either by mechanical surface aerators or by diffusion of air bubbles through the tank, with or without the use of submerged turbine mixers. The treated water overflows the basin to a clarifier, where the activated sludge is settled out to be recycled to the aeration basin. The overflow water from the clarifier is discharged. Other biological treatment processes which also can be used, include fixed film, packed towers, fluidized beds, and suspended growth processes with integral clarification. There are two methods to treat waste water in sewage treatment plant. These are given below. The conventional sewage treatment involves three stages, which are called primary, secondary and tertiary treatments. The primary treatment consists of temporarily holding the sewage in a still tank where heavy solids can settle to the bottom while oil, grease and lighter solids float to the surface. The settled and floating materials are removed and the remaining liquid is discharged or subjected to secondary treatment. The secondary treatment removes dissolved and suspended biological matter. Secondary treatment is typically performed by indigenous, water-borne micro-organisms in a managed habitat. Secondary treatment may require a separation process to remove the micro-organisms from the treated water prior to discharge or tertiary treatment. The tertiary treatment is often defined as anything more than primary and secondary treatment. Treated water is sometimes disinfected chemically or physically (for example, by lagoons and microfiltration) prior to discharge or it can be used for the gardening purpose. In the second method which is the ozonation method, the incoming raw sewage pass through a bar screen chamber to remove coarse suspended solids, fibres, plastics etc. and is collected into a septic tank / holding tank. The tank normally has 24 hours to 48 hours holding capacity, with suitable compartments to separate the heavy sludge solids present in the incoming sewage. A sewage transfer pump transfers the raw effluent into a manual self-cleaning filter, pressure sand filter, and then onward to an ozonator. Ozone is injected into the raw sewage and mixed in to a contact chamber / holding tank. The ozone oxidizes the organics present in the sewage, thereby reducing the BOD (biological oxygen demand) / COD (chemical oxygen demand) levels of the sewage to acceptable limits. The ozonated effluent is filtered through a pressure sand filter to remove trace suspended solids / turbidity, etc. The outlet water can be reused suitably for gardening, etc. A common practice in the waste water treatment within the steel plant is to combine waste waters from several different types of operations for treatment in a so-called terminal treatment plant. This practice has been particularly successful in the handling of waste waters from the various finishing operations. These waste waters may typically contain suspended solids, free and emulsified oils from cold rolling, acids from pickling rinse waters, and heavy metals from pickling and coating processes. In a typical system, acid streams are mixed with the emulsified oil streams to break the emulsions. The combined wastes are then passed through a gravity-oil separator, neutralized with lime to remove acids and precipitate heavy metals, and treated for removal of solids and any remaining oils in a clarifier or filter. Chlorination is one of the technologies for the treatment of ammonia, phenols, and free cyanide. Chlorine has long been utilized as a biocide in the drinking water treatment facilities and is known for its strong oxidation potential. When chlorine is added to water, hydrolysis of the chlorine molecule occurs, creating hypochlorous acid and hypochlorite ions which together comprise the free available chlorine. Alkaline chlorination (at pH greater than 9.5 in the presence of excess chlorine) is needed for the destruction of free cyanide. The term breakpoint chlorination comes from the observation of the point of the maximum reduction of chlorine residual while subjecting a sample to increasing chlorine dosages. The theoretical chlorine quantity ratio for the treatment of ammonia is 7.6 parts of chlorine to one part of ammonia. In practice, quantity ratios of 8:1 to 10:1 is generally needed. The optimum pH is usually in the range of 6.0 to 7.0. Care is required to be taken to provide sufficient chlorine to complete the reaction to avoid the formation of chloroamines. Additionally, the competing demand from phenols, nitrite, ferrous iron, sulphites, hydrogen sulphide, free cyanide, and other organics must be accounted for in the total chlorine demand. Alkalinity may also need to be added to the waste water for the maintenance of the desired pH. Approximately 14.3 mg/litre of alkalinity (as CaCO3) is consumed for each 1.0 mg/litre of ammonia nitrogen oxidized. Sometimes dechlorination of the final discharge is also needed. This is generally done by adding sulphur dioxide, sodium bisulphite, or activated carbon. The advantages of the process are that it has rather consistent process performance, has low space requirements, and can reduce the ammonia concentrations in one step. The disadvantages of this treatment method are the potential formation of trihalomethanes (THM), an increase in total dissolved solids (TDS), and the relatively high operating costs. This is why the technology is usually only applied to treat small concentrations of contaminants, or as a polishing treatment.